How are you Steemian? This time let me write about SEO Tips for Steemit, a topic I rarely write. Readers must be wondering, why I write about Search Engine Optimization (SEO) when this topic is not something I usually write? The reason is very simple: I see Google search box, the leading search engine now, in Steemit. Fadily, I searched a topic through the search box, analyzed the search results, and learned the structure. Everything is exactly like when we search on the Google site. The search results match the keywords we type. I also thought, that SEO techniques and tips are needed when writing something in this Steemit, so that our writing appears on page one (we used to call it page one). I'm not an SEO expert, but I've spent a lot of time to learn about SEO while actively writing blogs. To test my knowledge of SEO, I built a job site. The result is not much, but most traffic / traffic to the site comes from google search. 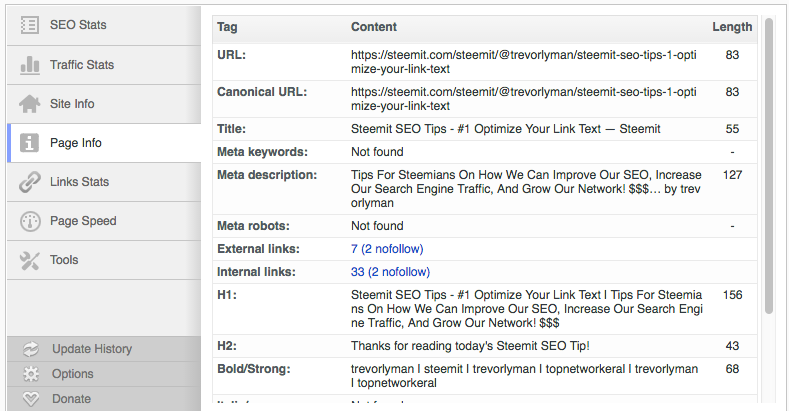 While still active I optimize, some keywords even appear on page 1, some of which are in the first position. After that, I stopped learning SEO, because that's my habit: I stopped when my curiosity was satisfied. Well, the SEO tips I share through this post purely based on my own experience. Apologies, if the discussion is a little superficial and does not make the reader satisfied. In order to be easy to understand and practice when writing, I start with an example. In my opinion, SEO is just a matter of creativity and logic. For example, when looking for something in a search engine, we usually type a very specific keyword. 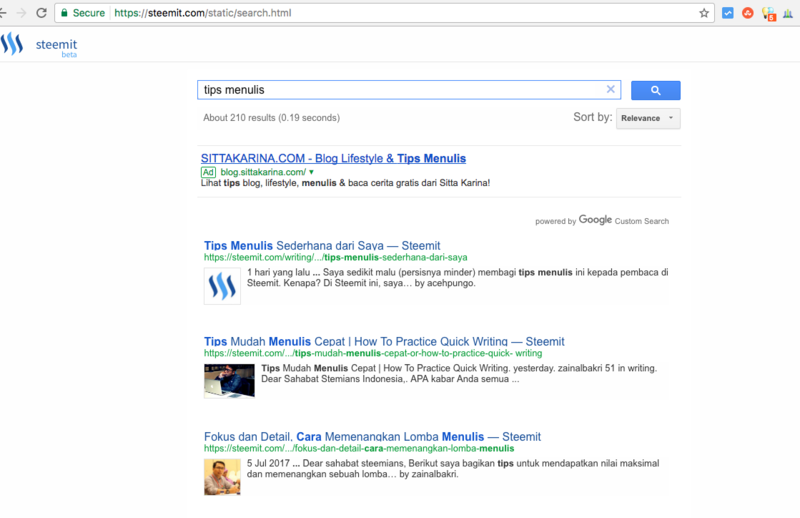 In this case, I use the keyword example 'SEO Tips', then I type in the search box that is in Steemit (Google search box). The result, as you can see in the picture below, there are 1,030 search results for SEO Tips keywords. For the title he uses 55 characters, and this is great. As for the description he uses 127 characters. For information, a good description that contains between 150-160 characters, because it is preferred by Google. But, if we search results in Steemit average description between 125-130. How should we write a good meta description? I think, still try between 150-160 characters, but the key word is written at the beginning, as done by @trevorlyman. For a word count in at least 300 words, as required by Google. I usually apply SEO techniques when writing in WordPress. There are two popular plugins that are widely used today, All In One SEO Pack and Yoast SEO, and we can choose one of them. I myself often use these two plugins, depending on the needs. For those who are proficient in SEO, can use All In One SEO, while the need content analysis tool whether the application of SEO is correct or not, can use Yoast. By mastering SEO techniques and know how these two plugins work, we will easily apply it when writing in Steemit. Simply put, make every writing in Steemit contains at least 300 words, title no more than 65 characters, description between 150-160 characters. The title of the post should contain one keyword, and the keyword must be in the description. For description, the default is in the first paragraph. And another one, for 2017, Google uses Fred's algorithm to determine a site worth appearing on the first page of search results. One of the important things about Fred's algorithm is related to the relevance of a link on a site. In the past, we know the term internal and external backlinks. We will be happy if many backlinks that lead to our site. Now, with the Fred algorithm we are actually required to optimize the internal links, especially with relevant posts. For example, because I've written about SEO Tips, then later when writing again about SEO, I need to create a link that leads to the post. Ending writing SEO Tips for Steemit, I am interested in one comment I read in Steemit. "SEO is dead. It should be GSO: Google Search Optimization: p," wrote @rahul.stan in a commentary in a post about SEO on Steemit. Yes, whatever we write seems to be to Google's taste. Although Steemit rewards system based on post, upvote, resteem and comments, there is no harm if making SEO friendly writing. Because, who knows many steemit users looking for a topic through the search box in Steemit, and thankfully our writing appears on the first page. Informasi ini sangat membantu saya menulis topik yang bagus di Steemit. 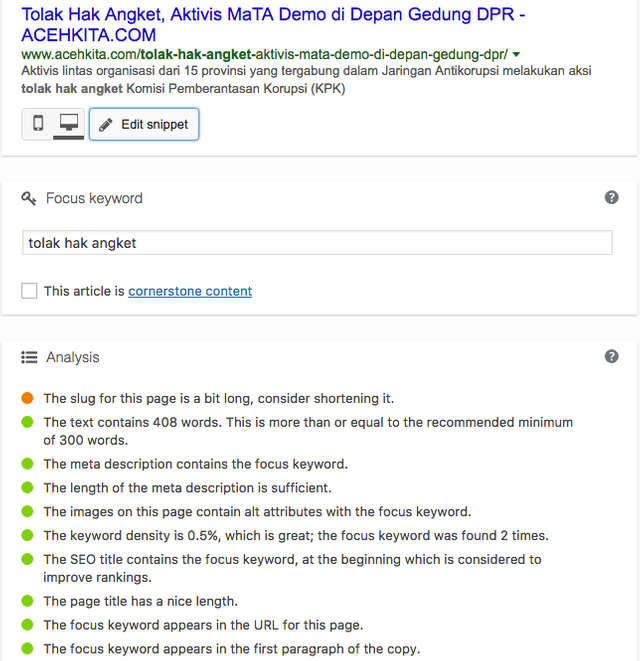 Terutama konsep SEO yang sangat penting dalam proses bekerjanya sebuah index tulisan. Thank you @omega-not for the comment and your test. Bereh tat bang, sangat bermanfaat... Terimong gaseh.